Delicious food, new music discoveries, crazy wind and rain, muddy boots, glitter, incredible people and so many smiles. 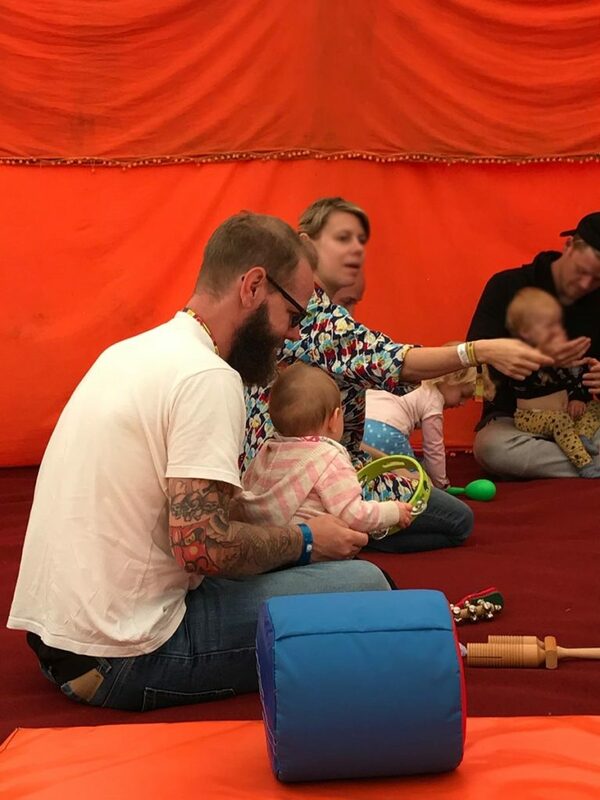 Camp Bestival 2017 was amazing and the best place we could have chosen for our first festival with a baby. 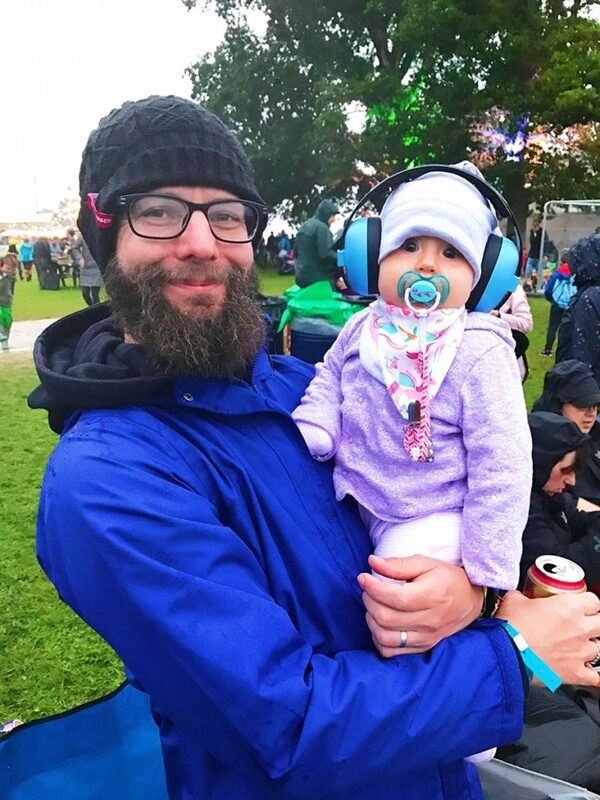 When we told people that we were going to a music festival with a 9 month old we got a mixture of responses from “are you crazy” to “Avery is one cool kid” and almost everyone we met at the festival said how brave we are. But I wouldn’t say we are brave or crazy (okay, maybe a bit crazy), because we a firm believers of things are as difficult as you make them and it’s all about how your approach things. A festival with a baby was much easier than we thought it would be and Avery had such an incredible time and the memories we made will last a lifetime. Even though we left before 7am, we didn’t arrive in Lulworth, where Camp Bestival is staged until gone 4pm because we stopped off in Oxford on the way. It’s a long way down to Dorset from Manchester, especially with a baby and it was a good excuse to visit somewhere new. 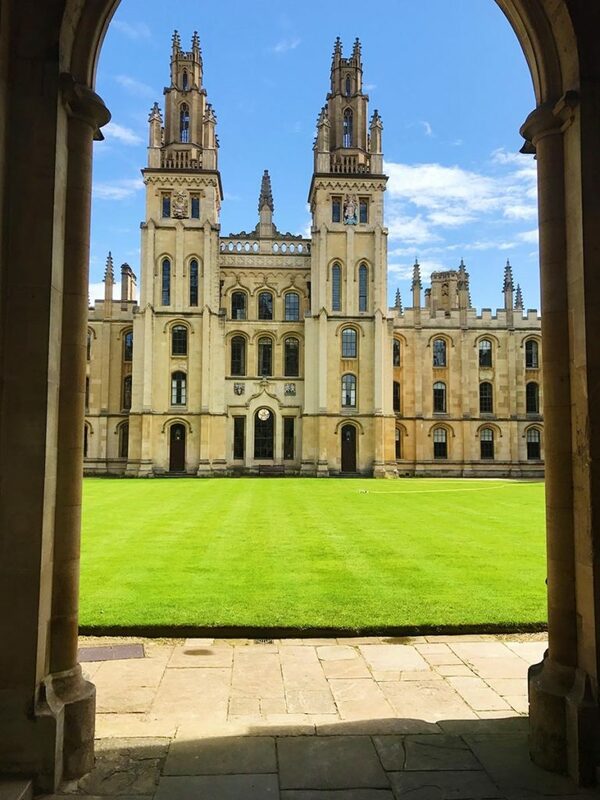 Oxford is an incredible city and I wish we had more than a couple of hours there. The architecture was stunning, there were so many great little cafes and it just had a really good vibe about it. It definitely helped that the sun was shining and it’s on our list to go back to soon. 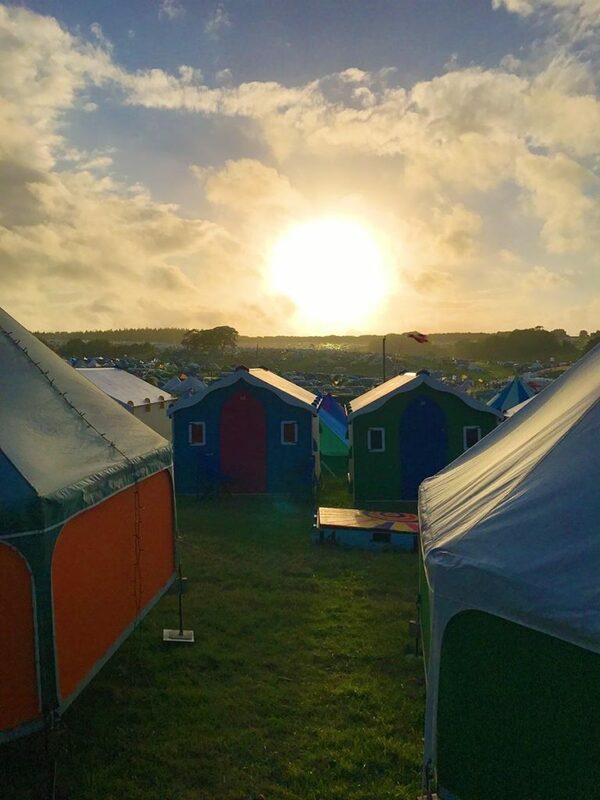 As we headed down to Dorset, we soon started to see the signs for Camp Bestival and joined the queues of campervans and cars loaded with every camping essential (and non essential) that you can think of. We headed down a gravel track towards boutique camping, where we would be leaving the car for 4 days to stay in our glamping OctoPod that we were kindly given by PodPads. As the track ended, we were greeted with our first glimpse of the festival site in all its glory, with the Big Top Tent dominating. Even a day before the festival officially began it was buzzing. We parked up the car and began the not so fun part of a festival and that is ferrying all your stuff from the car to your tent. The last time I did that was at Download Festival 10 years ago and I was drinking wine whilst carrying stuff so it made the experience much more enjoyable. This time, with a baby, that wasn’t really an option. We loaded everything we could in to the pushchair and on to our backs and headed down the hill to security. Security was very tight, and even my dry shampoo wasn’t allowed in, but it’s understandable given everything that happening in the world at the moment. Once I said goodbye to my dry shampoo we we off towards the boutique camping area to check-in. I love the idea of having a check-in at a festival – it’s like a hotel in a field. The check-in was simple and we were shown to our OctoPod which we would call home for the next 4 days. Dave did a couple more trips back to the car to get the rest of our stuff (seriously, so much stuff), whilst Avery and I made our little pod more homely and so she could have some time to roll around and play after a long time stuck in the car. 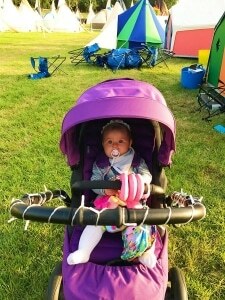 Whilst we were fully prepared to camp at the festival, having an OctoPod made our first festival experience with a baby so much easier and given how the weather turned out it was a total blessing. There were 4 beds in there, so we pushed 3 of them together to make one big bed for Dave and I and then Avery’s travel pop-up tent and then used the other bed to put our clothes on. There were tables with lamps, plug sockets, and a little fabric shelf. The lights and plug sockets were much appreciated and meant we could keep everything charged and also plug our travel kettle in for sterilising baby bottles and having a morning coffee. It even had a lockable door, for added peace of mind. 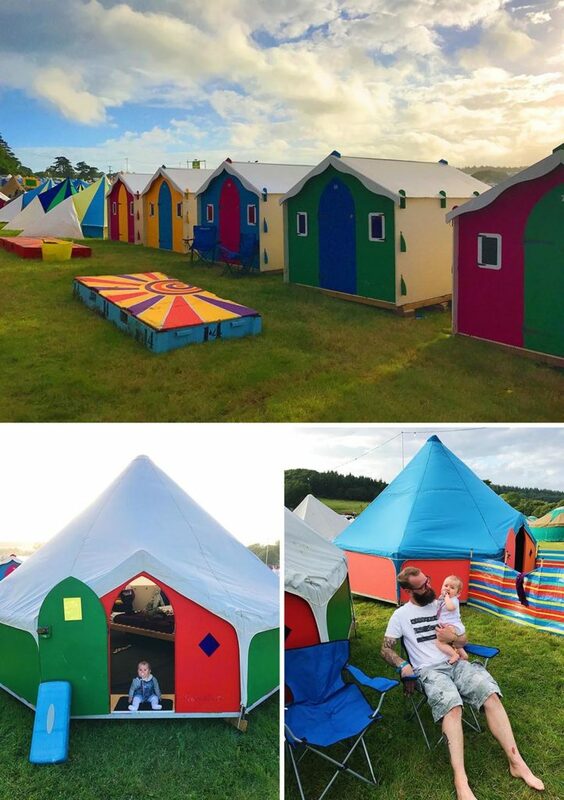 If you are going to Camp Bestival (or any other festival that PodPads are at) in a group or are a family, then these are a great options and these are different choices for different sized glamping options too. The toilets are much nicer than in the main arena and there are showers too. All in all, it makes things much easier with a baby and gives you a little bit of luxury amongst all that mud. Well, it wasn’t muddy at first – we will get to that bit later. The Thursday evening was beautifully sunny and it couldn’t have been a better start to the festival. 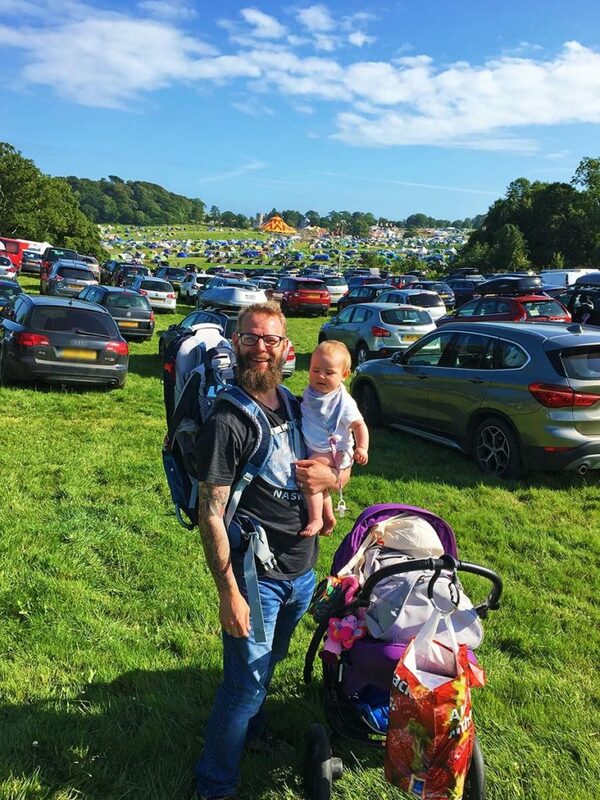 Everyone was setting their tents up in the sun, the sound of cans of beer being cracked open echoed across the fields and the smell of festival food drifted over from the vans in the festival area. As we walked over to where everything was happening (with our own can in hand), we were given a smile from everyone we passed as that “my feet are currently dry and I haven’t got bored of pot noodles yet” feeling was infectious. We saw so many people with young children, so we knew we were amongst kindred sprits. Now I could tell you that we immersed ourselves in to festival life at full speed, but the reality is we were shattered and just wanted to get a burrito and then head back to our OctoPod for an early night. 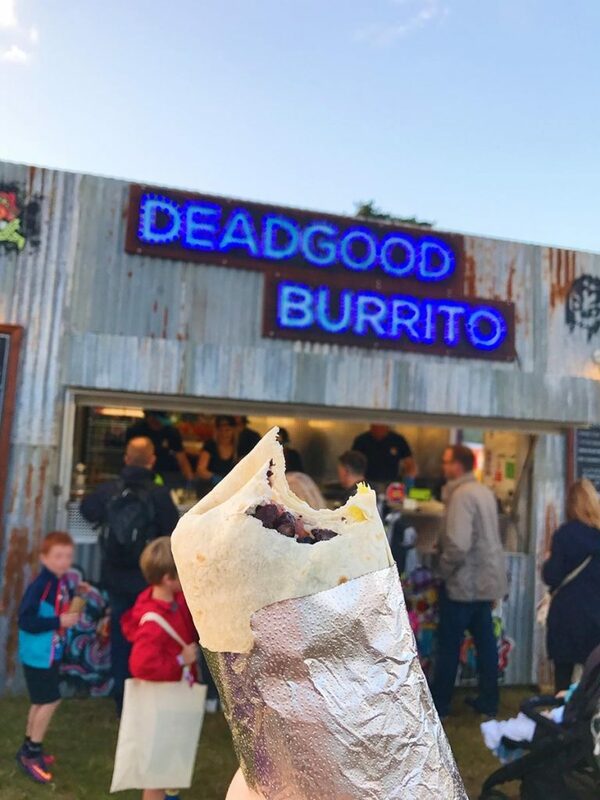 We picked a good food stall for our first Camp Bestival culinary delight, because Dead Good Burrito stood up to it’s name. It’s was fresh, filling and mine packed serious punch with the spicy sauce. We wandered back to the campsite as day turned to night and the party atmosphere set in. I was worried that it would be too noisy to sleep, but we were all that tired that was just have passed out straight away. This was the night that Avery slept through the night for the first time!! She clearly took to festival life better than we imagined. We woke up at first light, because our tent was cream coloured, it flooded with light in the morning. Not that it was a bad thing, as there are certainly worse ways to wake up. Being a family friendly festival, everyone is up pretty early and kids are playing around the tents whilst parents cook breakfast on the camping stove – it’s a nice change from the usual morning festival site of half naked 20 somethings hanging out of their tent with a bottle still in hand (no judgement – we have all been there). We walked over to the main festival area around 9 to visit the Dorset Cereal van, as they were the ones kind enough to give us our festival tickets so we could check out what they were offering at the festival. When we got there their van was already the most popular one in the field. Hordes of people were queuing up to put in their order of cereal and excited to try out an array of new flavours. Staff were on hand to take your order of cereal, type of yoghurt or milk and then topping of a compote. 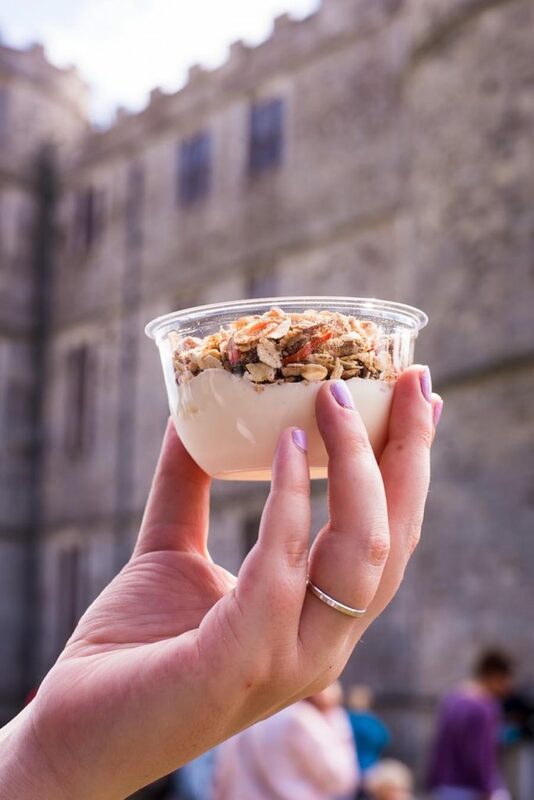 These little pots of cereal were a welcome change to the usual festival breakfast choice of greasy filling in bread and that was evident by the smiling faces walking away from the van, pots of breakfast in hand. We got to try out a few new flavours of Dorset Cereal, and the Ultimate Adventures Machu Picchu is now a firm favourite in our house. 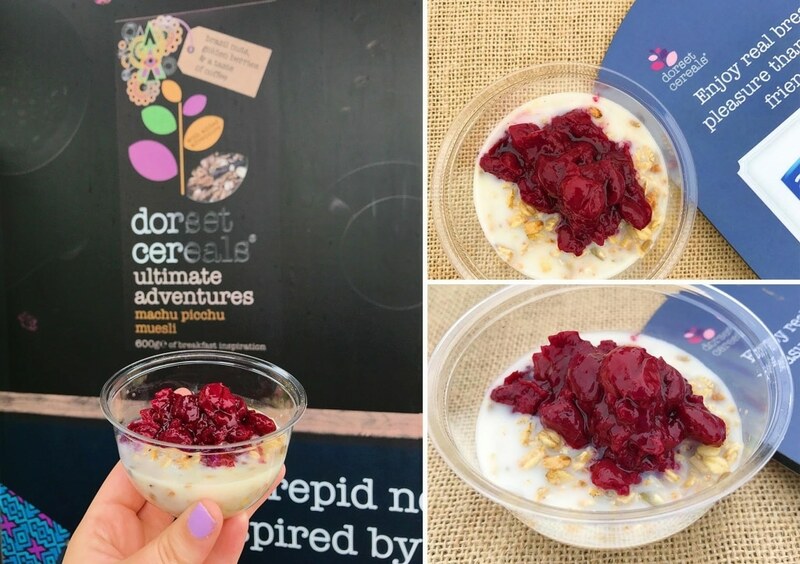 The Ultimate Adventure collection is inspired by their travels, which is how we come up with our recipes too, so it’s another reason we love Dorset Cereals so much. This festival really is all about the kids, which is why we wanted Avery to have as much fun as possible. That wasn’t going to be hard when they had a dedicated soft play area for under 5s that had a giant ball pool in it. 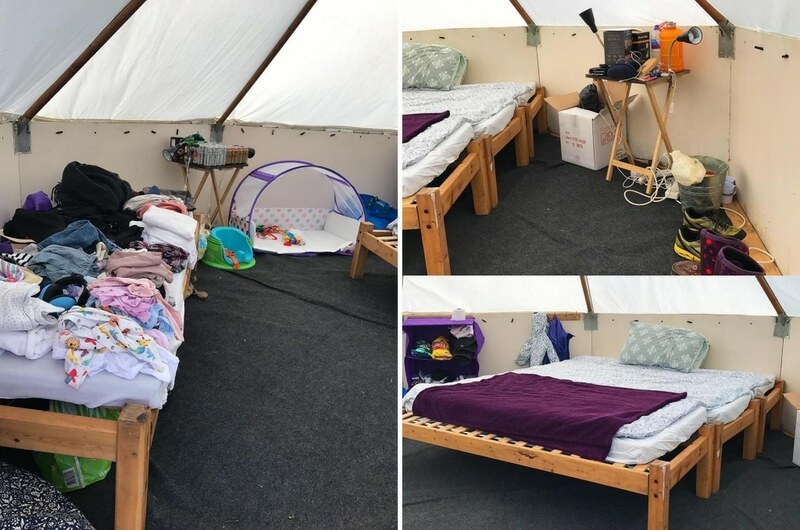 Before the first act we wanted to see hit the stage, we spent some time playing in the soft play tent and even joined in with music time – it was a home from home for Avery. We entered the tent to beautiful sunshine and we left to pouring rain. From now on it would be referred to Damp Bestival! 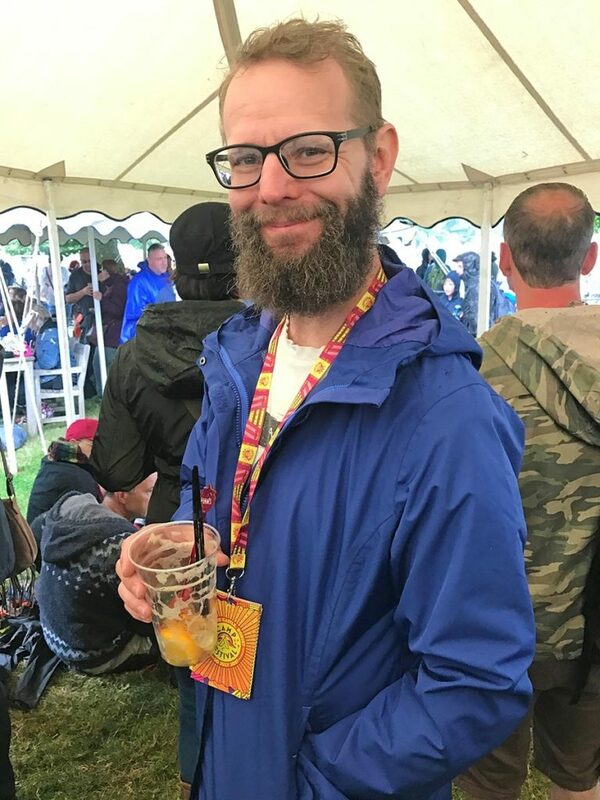 What else do you do when the weather is crap at a festival? Drink!!!! 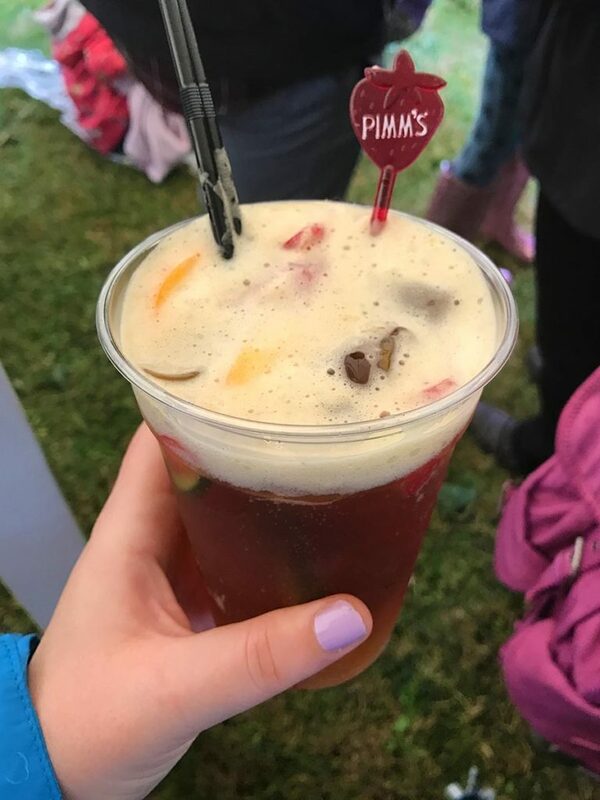 Avery was sound asleep in her pram, so we headed to the nearest place that was undercover and had a bar and got ourselves a jug of pimms. Luckily enough there was a guy there doing an acoustic set and he was pretty good. Good enough to listen to for an hour or so until our bellies stared rumbling again and we went and got a burger – back to festival food basics, but this burger was far from basic. It was time to see the first act on our list of must-sees this festival and that was Mr B. 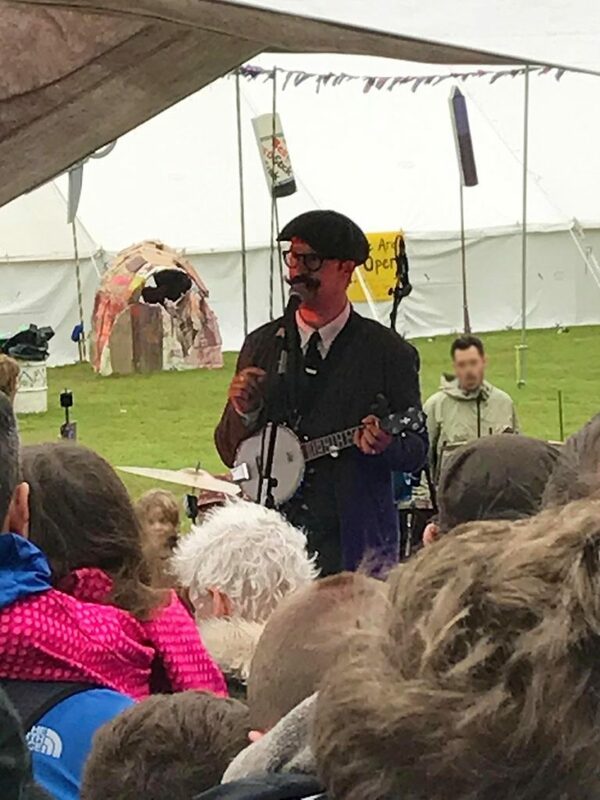 The Gentleman Rhymer. The only was to describe him is “chap-hop”. It’s basically hip-hop in a posh, English accent and he is genius. He is like no other act I have seen before and had me in stitches for the whole 30 minute set. Forgive the poor quality picture – it was zoomed in as the crowd was so big, we couldn’t get close. 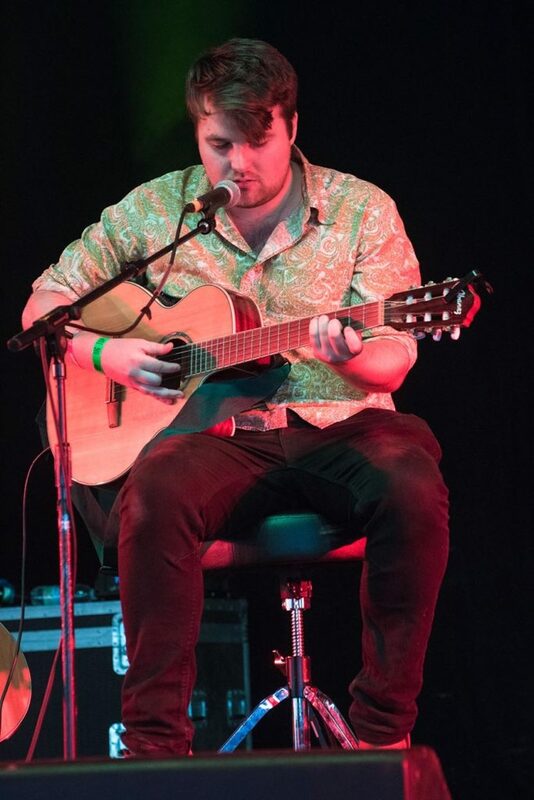 Next up were Mexrrissey who are a Morrissey cover band in a Mexican style and then Swan Levitt who is an acoustic singer songwriter with a Ben Howard vibe. We also popped into the Bollywood tent where DJ Mark Archer was whipping the huge crowd into a frenzy with his Techno/House mixes. The whole tent was a full-on rave at 5pm, but I guess when that beat drops, it doesn’t matter what time it is! 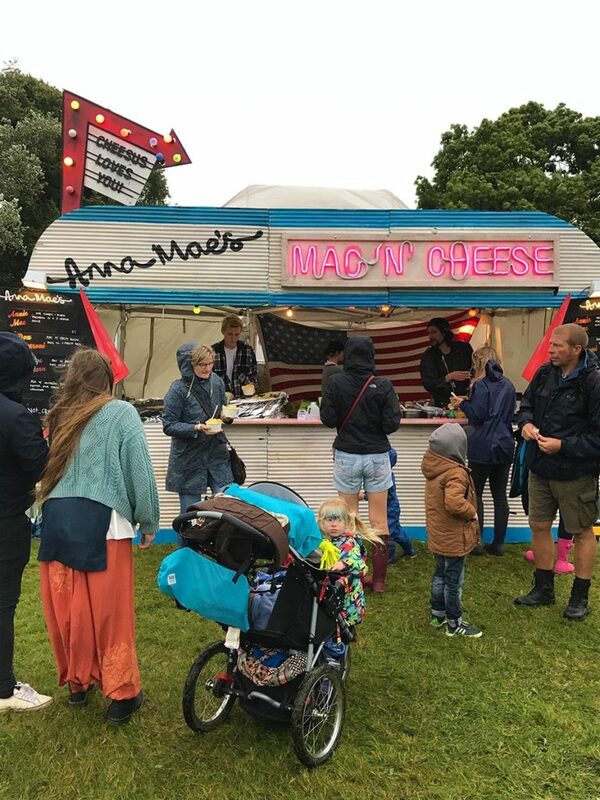 It started to get pretty cold, so we layered up and went in search of comfort food and found it at Anna Mae’s Mac and Cheese. 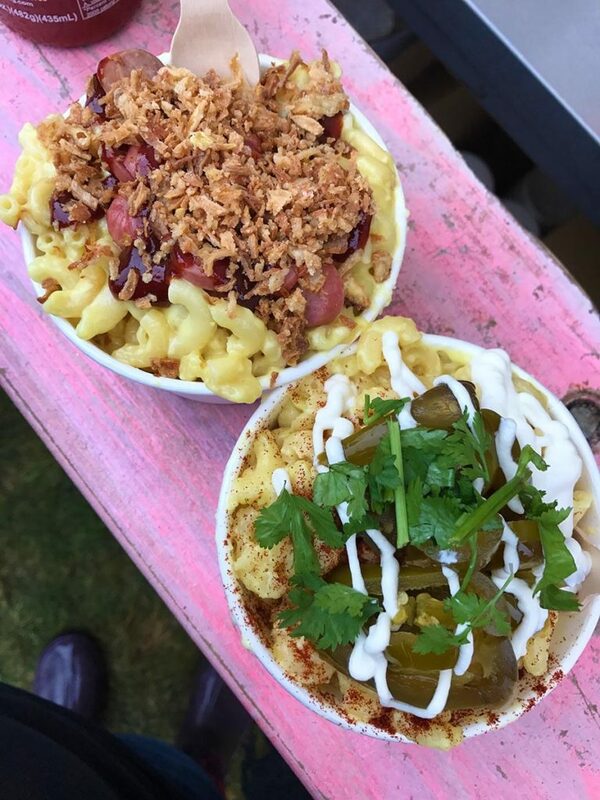 Think pimped-up Mac and cheese like you have never tasted before. We went for the Kanye Western, which had onions, BBQ sauce and hot dogs on it, and Mexican version called Spicy Juan topped with jalapeños and sour cream. Although initially we thought it was expensive at £9, it was really filling. We headed over to the main stage to claim our own spot to see the next act on our list – The All Saints. A childhood dream came true and they didn’t disappoint, playing all the classics. 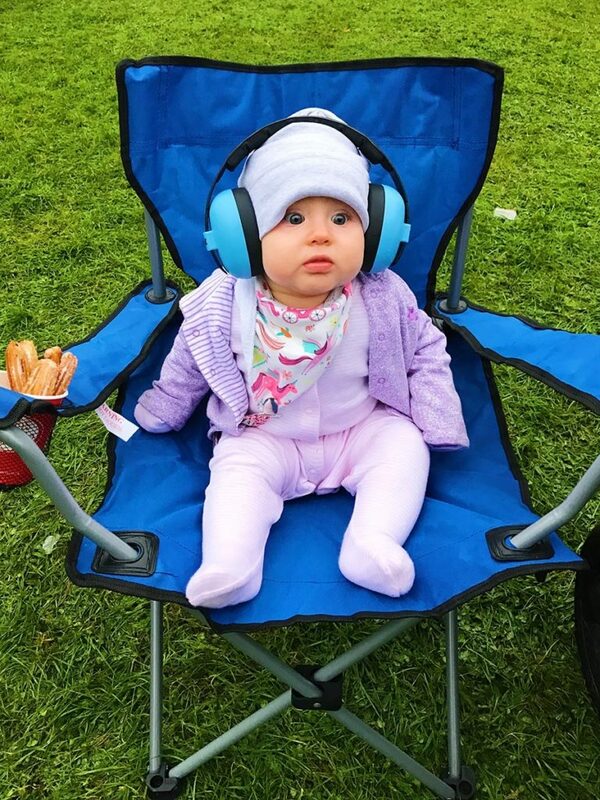 Even Avery enjoyed it in her camping chair with her ear defenders on. If you are going to any event that will be loud or with music, then these baby ear defenders are great – you can pick them up on Amazon. 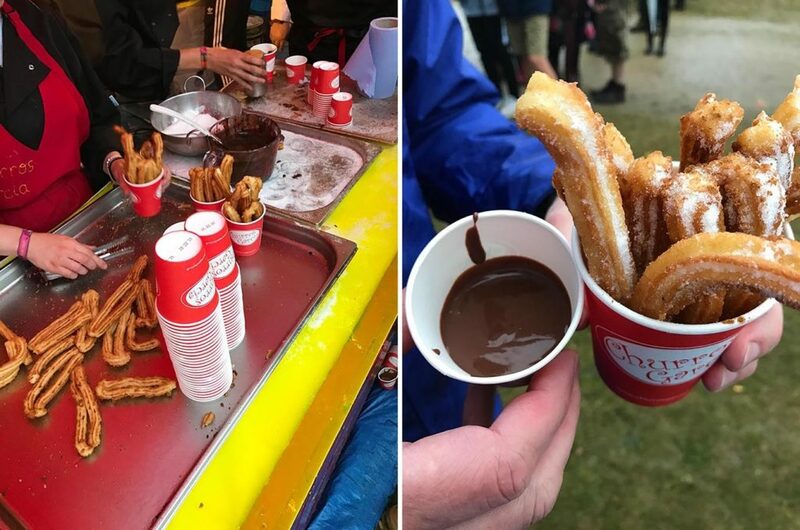 Before we went to Camp Bestival, we had heard a lot about the Churros stand, so we had to check them out and see what the fuss was all about. They are alright, but not the best churros we have ever had. But they were nice and warming on the walk back to the tent. The weather was absolutely awful and Avery was tired, so we decided not to stay out for Friday’s headliner Mark Ronson. However, we still managed to hear his set all the way in our camp site, and by all accounts, he totally blew off the roof with a storming set. A shame we missed him, but there were still plenty of acts to look forward to over the weekend. 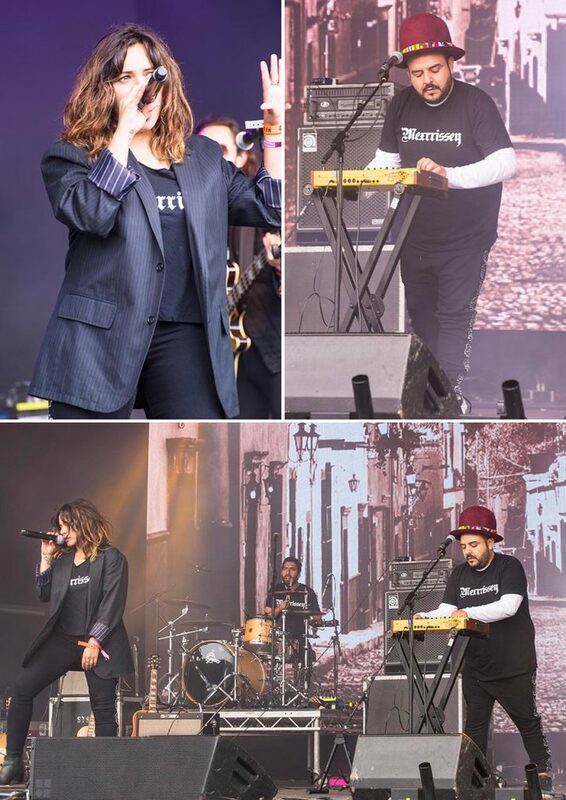 So, our first two days at Camp Bestival were quite the experience. You can read about the Saturday and Sunday in part 2 of our review, coming soon. Great festival, sounds like total fun to me. Sounds like such a fun time! But I hear you about the weather, here in California, many of the big music festivals are always in the desert when the weather is just terrible. My husband used to have to work at these, so we never participated as festival goers. Sounds like a wonderful time. No festival is complete until you have churros! 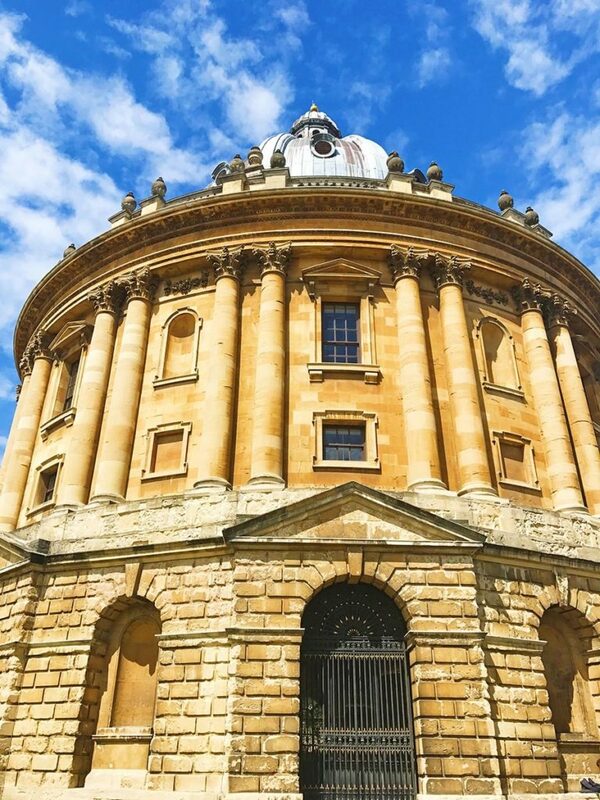 I’m an Oxford local and I’m so glad that you loved it here! Bestival sounds fab, I’ve been meaning to go for years! I Thoroughly read your post and saw your lovely pics and can understand why you enjoyed yourselves. Camp Bestival is on my list now to visit. Thank you so much for sharing your experiences. Oh my god, the mud! I might have gone home after that if I didn’t have glamping like you did. Didn’t you have to take a ton of stuff to Camp with a little one? You might have actually convinced me to give a festival a try. I have a 5 year old son and I know he would love something like this, I am just a bit of a wuss. I am on the Isle of Wight and or some very strange reason never went to Bestival. 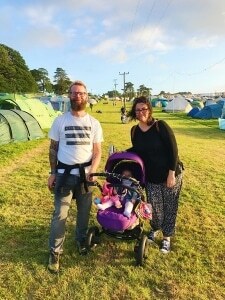 But may definitely try Camp Bestival next year with our little one! What a great festival and well done with having a wonderful time with bubba in tow. All the food looks great but I would have definitely been hitting up the Dorset Van for breakfast! I loved following all your photos at the festival. Avery was definitely the star of the show. Camp Bestival has never been on my radar before now, but I am seriously tempted to go next year and take Cooper. What a fun looking festival. I couldn’t Camp in a tent, so those little pod look much more comfortable. 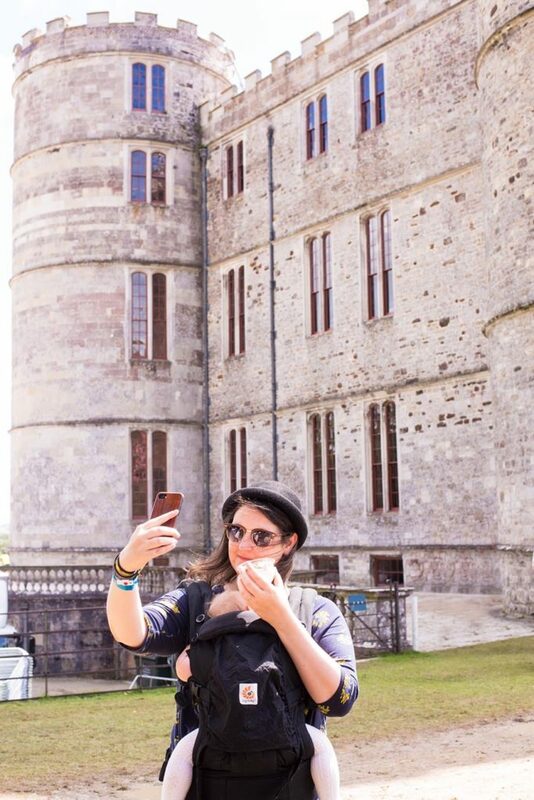 You guys have the best trips and I think it’s awesome that you still live your life with a baby. Hope the weather improves. What an amazing experience and all that food looks fantastic. Love the look of the accommodation. I’m really sad we didn’t make it to a festival this year…I’m determined for next year! Wow! Cool parents. I bet your baby is going to be a music-head when he grows up. Rock on guys!